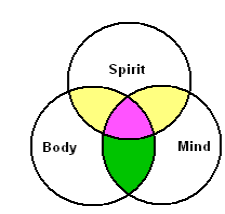 Holistic Health for Body, Mind, and Spirit Weeks Two and Three. lettuce, spinach, etc. One big salad does it. avocado, grapes, cherries, watermelon, coconut, etc. Try to eat in season. milk rather than cow milk. Remember cow's milk is made for animals that are growing to 1000 pounds. Servings are 1 oz of cheese, 8 oz of milks, or 1 Cup of pudding equal one serving. Start simply and enjoy the relaxation. Start here these two weeks. Meditation. Find your mantra and use it. What is a Mantra? Here is a list of Mantras. Try one on for size! I love you; I'm sorry, Forgive me, Thank you. Take time to plan menu and shop for healthy foods and vitamins. become more acquainted with the method. EFT tapping while watching yourself. satisfied that you did your whole program. Concentrate on these practices for the next two weeks.